Interview by Sarah Batcheller. Written by Shannon Seibert. It’s only natural to go through periods of loss or grief in the course of your lifetime, and Dr. Paul Coleman is the perfect person to guide you back to inner peace. The Central Michigan University graduate has authored 12 books and has accumulated over 25 years of experience in his psychology practice. 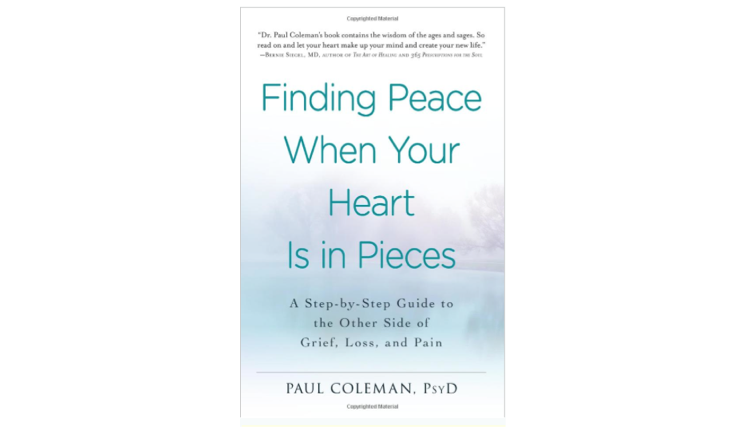 In his new book Finding Peace When Your Heart Is in Pieces, Coleman encourages his readers to utilize the Four Paths of Transformation — acceptance, inspiration, release, and compassion — to move past suffering after a heartbreak. His words provide his readers with support and encouragement during their journey of recovery. Continue reading for our exclusive interview with Coleman and his personal thoughts on finding inner peace. How did you come up with the Four Paths of Transformation that you mention in your book? In life, we have lower and higher sets of emotions based on fear, desire, anger, worry, anxiety, and yearning for things that affect how we register life events and react to them. The lower set of emotions are what gets strongly activated when we’re going through some kind of emotional turmoil, life upheaval, or major loss. It’s natural for that to happen; however, you want to get to a place where, in spite of the loss, you can feel some degree of inner peace. Can you give us a brief explanation of what each path entails? The first pathway is the Pathway of Acceptance. Acceptance doesn’t mean that you like the situation or that it’s desirable; it simply means that we’re not going to emotionally resist reality. When you’re able to get to a place that says, “I may not like what happened, but I accept the reality,” then you have a bridge between lower emotions and higher emotions. The second pathway is the Path of Inspiration, where you allow yourself to be inspired or guided by insights or intuitions that ordinarily wouldn’t be coming your way. This transitions to the third step, the Pathway of Release. In order to help yourself transform, you have to go from a place of pain and suffering to a place where you are able to start integrating the loss with a new life. The final pathway is the Pathway of Compassion. Up until now, you have been focusing on yourself, but now, you have to extend yourself for others and discover that the meaning of your life is only going to occur in relation to others. Which path do you think is the easiest to follow? Which is the hardest? I think the path that is the easiest to follow is the Path of Compassion. You still have the capacity to care for others. It’s not that difficult, even when you’re in pain, to give a little of yourself to someone else. It doesn’t even have to be a great deal; it just has to be a little bit to get going. I think the hardest one is the Path of Release. This usually occurs at the phase where you’ve already accepted what has happened; you’re not denying it anymore. In this period of time, people feel very alone, but if you get the answers right away, you won’t learn the lessons that you really have to learn. Is there a particular path that is most important to complete following heartbreak? The Path of Acceptance — I call it the “foundational pathway” because, if you’re not accepting the loss or the transition, then you are emotionally resisting it. You’re basically saying, “This should not be happening,” when it is happening. You’re stuck on questions that you really can’t answer, and all of this keeps you from really moving forward. The beginning steps that people have to take are emotionally accepting their loss. It takes a while for your psyche to adjust to the loss. When going to your family and friends, you need to find out what it is that you really need from them. A lot of times loved ones try to be helpful, but they give advice that isn’t what you need to hear. If you just want people to understand your fears or your pain, it’s better to let them know upfront. In your opinion, is there one form of loss that is more traumatic than another? The unexpected loss of a child seems to be the most devastating. Many parents believe that it is their job to protect their children. Parents feel that sense of “What did I do wrong?” and “Could I have done something else that might have kept them alive?” If it was an accident, the parents often feel guilty. How does intuition play into navigating the Four Paths? Intuition is very important because you’re entering a new world, and the old ways don’t quite look the same anymore. In order to have intuition, you have to have a calmer mind. The way I describe it is your mind has to be like a lake where you can detect the ripple of a single leaf falling on that lake. If your mind is full of chatter and questions, that’s like rain drops on the lake. You’ll never be able to detect the ripple of the leaf. In your book, you mention the concept of self-love. This can be a difficult mindset to achieve when faced with loss and grief. What do you think is the most significant step in taking to loving yourself? When we think of loving ourselves, we compare it to how someone else loves us, and we often don’t have that same level of passion for ourselves. The first step is accepting yourself because you are not perfect and you never will be. So if you can accept that you have flaws and strong points and if you can accept that you are someone who is trying to do better, then you are on that pathway to self-acceptance. You can’t have self-love without self-acceptance; it’s an ongoing process that never ends. Pick up a copy of Finding Peace When Your Heart Is in Pieces today!